Lok Sabha Speaker Somnath Chatterjee is clear that the courts have no jurisdiction on expulsion of MPs from Parliament and will not respond to any judicial notices in the matter. Talking tough that he would not allow any quarter to corruption, he is keen that the government come forward with a legislation to set up a high-level commission to determine the salaries and allowances of the MPs. Should NRIs be granted voting rights? The freezing cold, coupled with disruption in power and drinking water supplies and icy road surfaces, affected normal life for the eighth consecutive day here today. 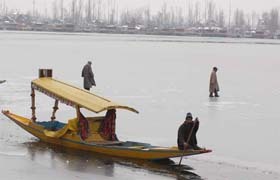 Two Kashmiri youths walk on the frozen surface of the Dal Lake, while a Kashmiri boatman guides his shikara through a narrow channel of water in Srinagar on Sunday. The controversy regarding the eviction of Sikh and Punjabi farmers from 1200 acres here took a new turn today when only nine families came forward to accept the cash compensation offered by the Uttaranchal Government in lieu of demolition of their houses. Six members of a family from Mohali were killed in an accident on the Pathankot-Mukerian road, near Mirthal today. Sources said the family was coming back after paying obeisance at the Vashino Devi shrine. In the early hours today the Maruti 800 in which they were travelling collided head on with a truck. In a rally organised at the Brigade Parade Ground today, the CPM leadership headed by veteran politburo leader Jyoti Basu and the state Chief Minister, Mr Buddhadeb Bhattacharjee, firmly resolved to create a new record of coming to power for a successive seventh term after the Assembly elections to be held in the state some time in May-June next. I am very, very clear. There can be no quarter for corruption and action will follow, howsoever, high one may be. The Civil Aviation Ministry has decided to spend Rs 80 crore on the expansion of the Guru Ram Dass International Airport at Amritsar. The frequency of Air India flights to Toronto (Canada) from this airport would be doubled by April. The Governor and Chancellor of Guru Nanak Dev University, General S.F. Rodrigues, today described universities as great instrument of change. He said according to the latest analysis the country would emerge as the largest economy in the next two decades. 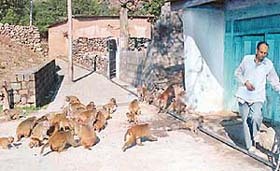 With lanes deserted, this obscure village in the foothills of the Pir Panchal range presents a curfew-like situation even at mid-noon as the residents not step out of their houses because of the fear of monkeys. A passerby in a deserted lane of Chirai village in Udhampur district tries to avoid the monkeys’ attention. Q: Should there be “one rank, one pension” for defence personnel?